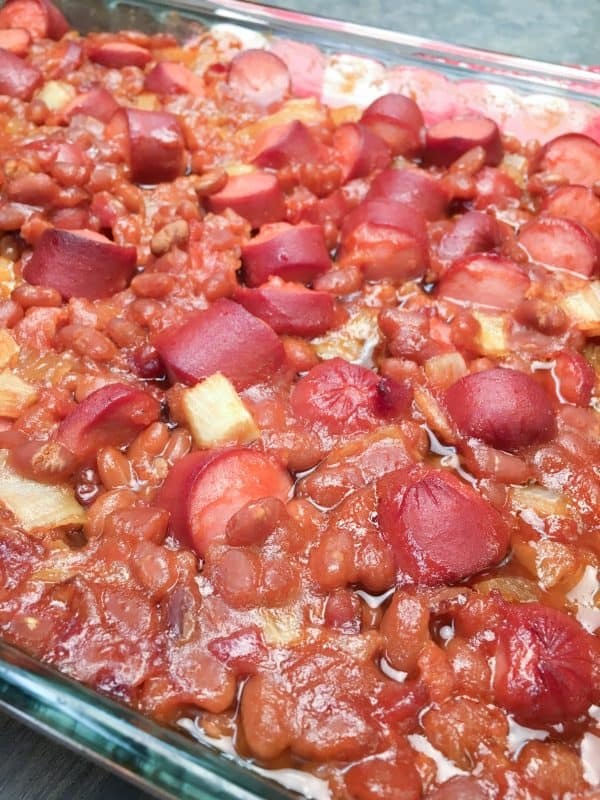 Baked Beans and Weenies are a great meal for dinner, football parties, or a picnic. 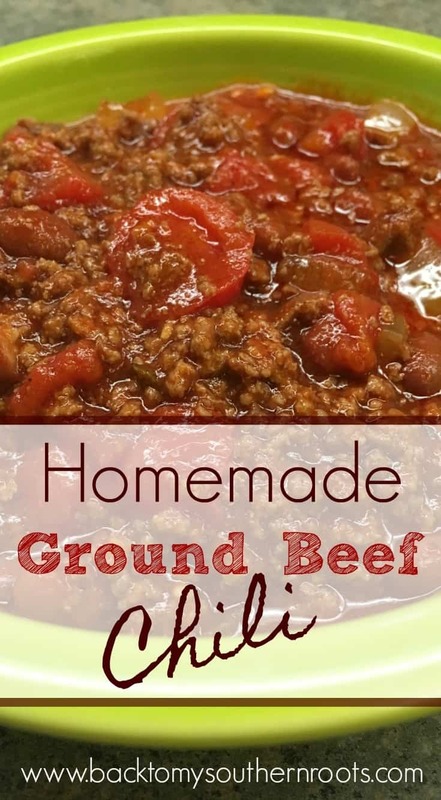 The flavorful, easy, and budget-friendly recipe combines sweet and hearty flavors. Happy Friday, y’all! I am so glad the weekend is here and I’m thinkin’ about easy meals. Do you ever get worn out from running around? 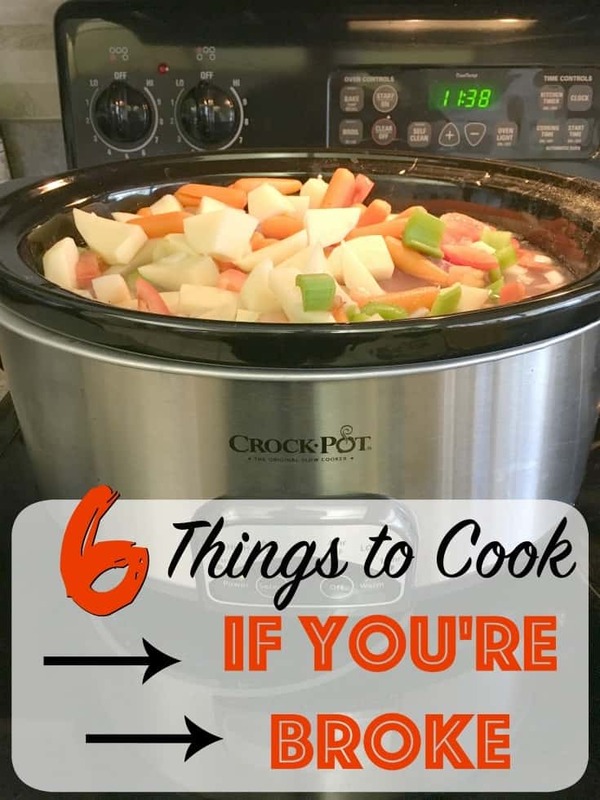 Are there a lot of weeknights you’d like to come home and only spend five minutes on a meal, but still give your family a good dinner? My boys are in middle school and we tend to run around a lot. They each go to a different school and I spend a lot of time in the car. So, there are a lot of evenings where an easy meal is the way to go. Baked beans and weenies does take at least 1-1/2 to 2 hours to cook, but only five minutes to get it ready – yay! Hot dogs sometimes have a bad rap. But, nowadays it’s easy to get healthy hotdogs and feed the family on less than fifteen dollars. 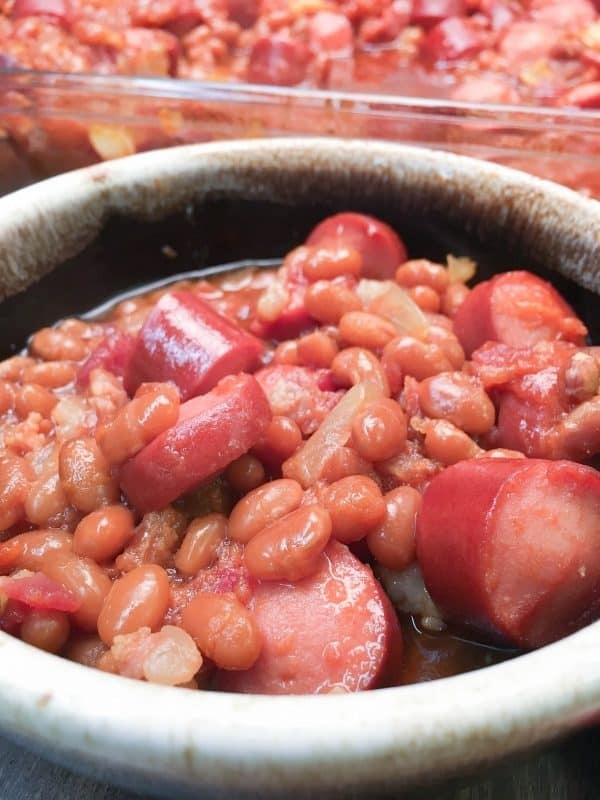 Baked Beans and Weenies is a budget-friendly meal that tastes great. You can also take the meal to football gatherings, church potlucks, and picnics during the summer. With my two growing boys, and a husband that loves beans, bacon, and hot dogs, we still have leftovers. 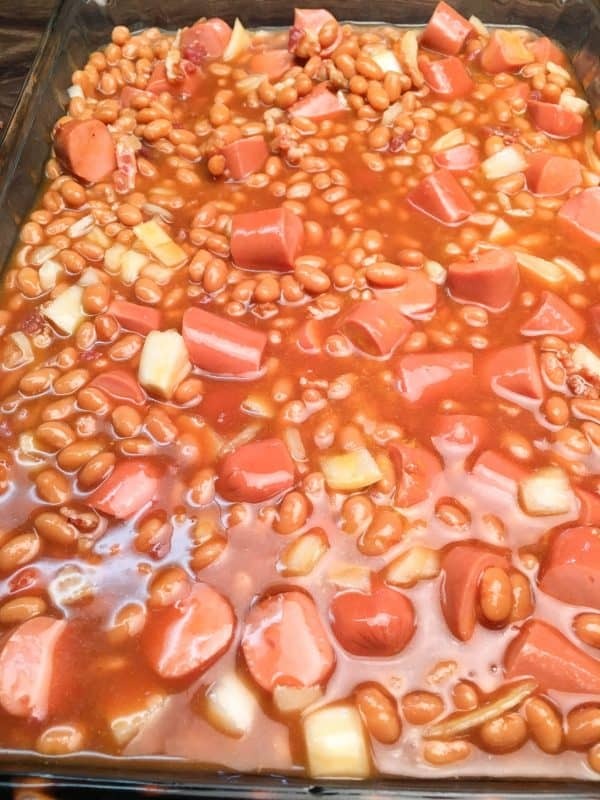 Add the can of pork and beans, brown sugar, bacon, mustard, ketchup, Worcestershire sauce, and diced onions to a large bowl. I purchased pre-cooked bacon to make like a little easier. You can also make the bacon ahead of time so it’s ready when you’re making the meal. 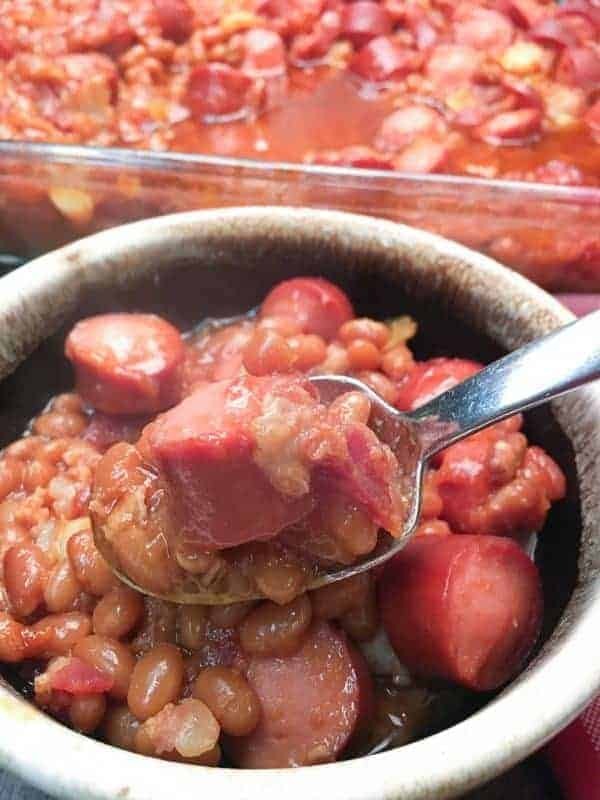 Cut the hotdogs into bite size pieces with kitchen scissors and add to the bowl. Add the mix to a greased 9″ x 13″ casserole dish. Bake at 350-degrees for 1-1/2 to 2 hours. The longer you cook it, the more the flavors will melt together. It’s ready to serve! It’s that easy. Enjoy! 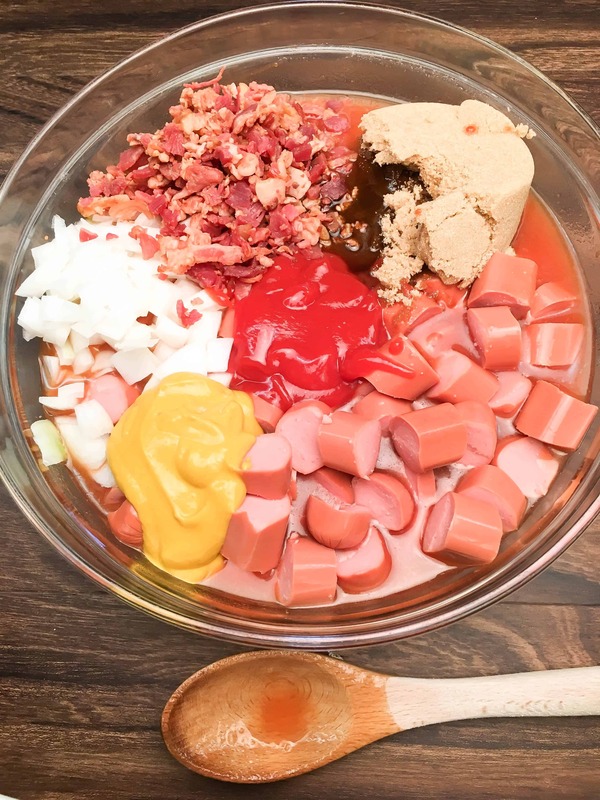 Add the brown sugar, bacon pieces, mustard, ketchup, Worcestershire sauce, can of pork and beans, and diced onion to a large bowl. 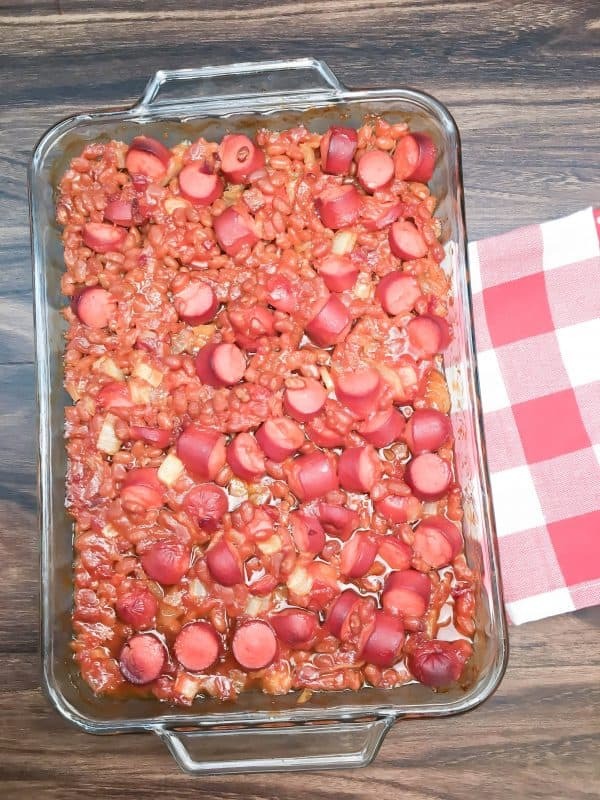 Cut the hot dogs into bite-sized pieces and add to the bowl. Mix everything together and pour into a greased 9" x 13" casserole dish. Bake for 1-1/2 to 2 hours. You’re welcome, Mary! Thanks for stopping by! Yummy!!! Thanks for posting this!! Add a little cornbread on the side and YUMO!! Hi Denise! Cornbread would be perfect!